The Rolex Submariner 1680, fondly nicknamed the “Red Submariner,” is a rare and highly prized Rolex model. Perhaps the most distinctive and valuable feature of the Red Submariner is the red writing on its dial. 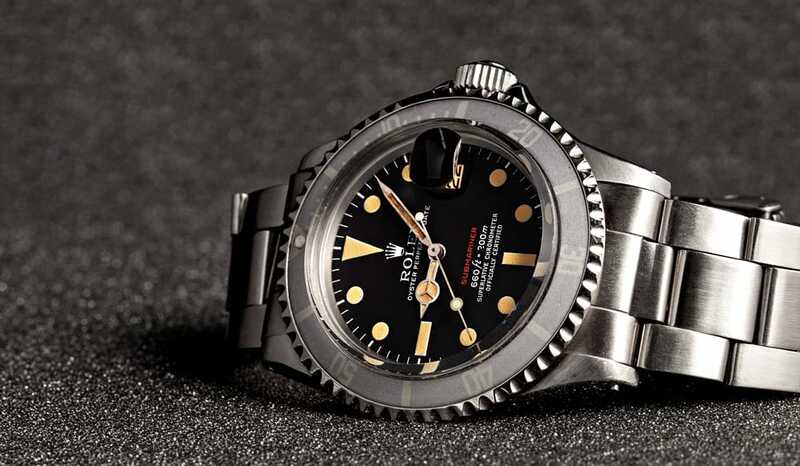 Produced from 1969 to 1979, a small batch of the Submariner 1680s featured the name “Submariner” written in red as opposed to the normal white. Red writing on Rolex watches has become highly valued and sought after by collectors. The Double Red SeaDweller, for example, is often times triple the price of similar models with white writing. Thus, the single red line of writing on the Red Submariner 1680 makes the watch much more rare and thus worth much more. A Rolex Vintage Red Submariner is a popular timepiece. The Red Submariner is a rare and luxurious model because it is the first Submariner to feature a date window as well as the cyclops lens above it. 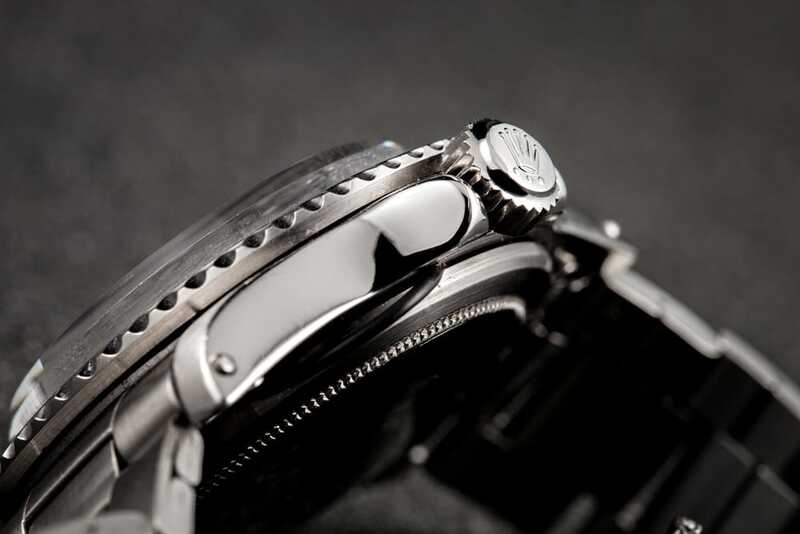 The watch’s crystal was also modified from other Submariner crystals, standing 3mm above the case and bezel. This unique feature makes this particular model recognizable. 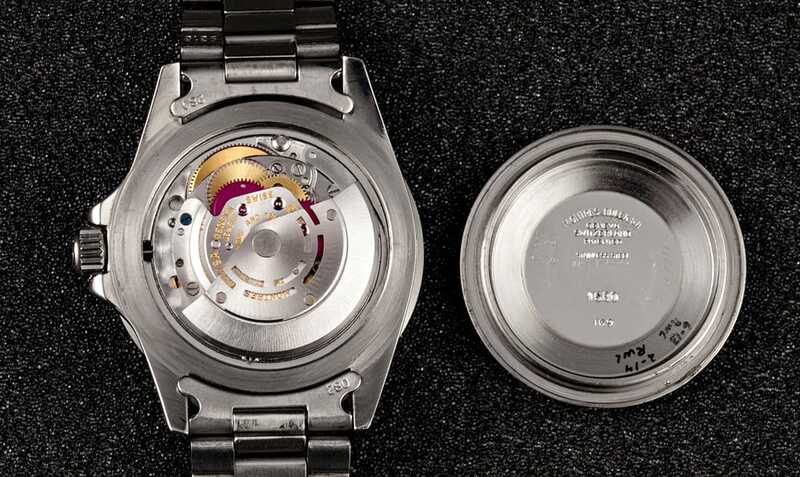 Here is the inside look of the movement of a Vintage Red Submariner. The Red Submariner 1680 features the 1575 Chronometer movement, which is essentially the same as movement 1570, only with the additional date feature. Like other Rolex watches of the time, the Red Submariner 1680 has a depth rating of 200 meters (600 feet). This Red Submariner has an amazing patina on both the dial and the hands. The Red Submariner 1680 was produced with seven different dial versions that have been consistently recognized by Rolex collectors. They are titled Mark I-VIII, with Mark II and III being produced simultaneous, and thus hard to differentiate. Some Red Submariner 1680s feature a rare brown dial variant. The brown dial most likely spawned from a manufacturing flaw. This flaw is now highly sought after by collectors, as so few brown dials now exist. The brown dial Submariners are generally only found in watches with Mark II & Mark III dials and case numbers in the 2.2M or 2.3M ranges. 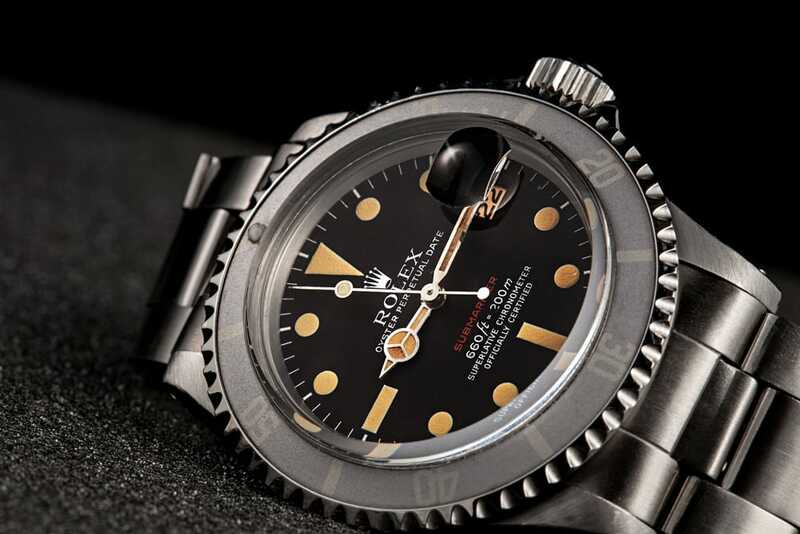 A Stainless Steel Rolex Submariner 1680 is on every collector’s wish list. The Red Submariner was a first in many ways. The Red Submariner 1680 is not only the first Submariner to feature the date window and cyclops lens, it also sports the highly sought after red writing. 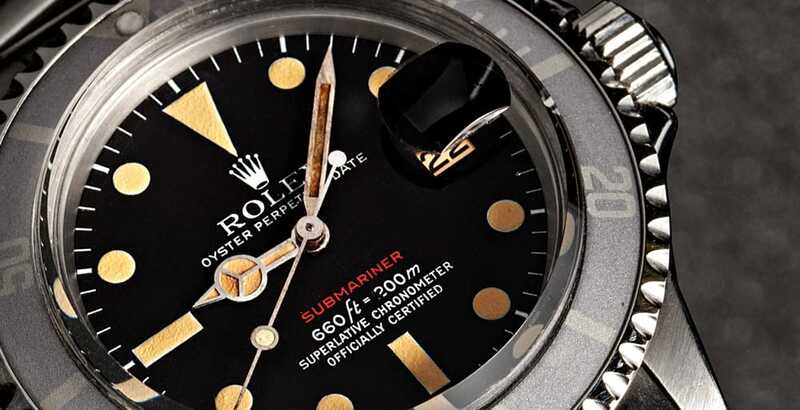 While other Rolex models, such as the Double Red SeaDweller, are widely known due to their high value by collectors, their smaller red counterparts, like the Rolex Red Submariner, are also highly valued. For the more conservative collector, the Red Submariner 1680 is a more affordable, yet still rare and aesthetically pleasing “red” Rolex. The guards on the Rolex Vintage Red Submariner 1680.